﻿ News Bharati - Gujarat's Dahej ethylene plant peaks to contribute in 2000 novel employment opportunities..! News Bharati - Gujarat's Dahej ethylene plant peaks to contribute in 2000 novel employment opportunities..! 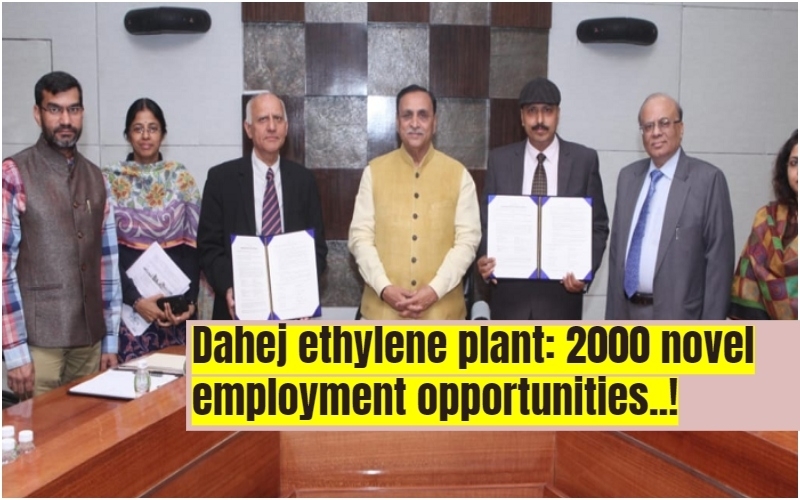 Gujarat's Dahej ethylene plant peaks to contribute in 2000 novel employment opportunities..! Ahmedabad, February 2: The Gujarat government on Friday signed a Memorandum of Understanding with the US-based Bio Chem USA LLC with a view to establishing a biorefinery in Dahej and ethanol to ethylene plant near Vadodara. Under this MoU, the company aligned will establish a bio-refinery that will produce fuel ethanol using plant-based raw materials such as corn. The Gujarat government also estimates that these projects if set up are capable of creating 2000 new employment opportunities in the region. “The proposal is to set up a large bio-refinery near Dahej PCPIR to process 10 lakh tons of corn and an additional 3 lakh tons of biomass per year to produce protein feed for animals, Bio-Fuel Ethanol and Bio-Jet Fuel. The Bio-Refinery is expected to come up with an investment of close to Rs 2,000 crore”, reported the statement. Meanwhile the Ethanol to Ethylene plant close to the IOCL refinery in Koyali demanding an additional investment of Rs 1,000 crore. It is according to the Gujarat government that India requires a large number of bio-fuels and this project will help the country reduce import dependency. “The bio-refinery will not only generate new jobs but also help the farmers who can sell cash crops to the refinery. Lastly, as Ethanol burns cleanly this will also reduce environmental pollution,” said Das, Principal Secretary, Industries and Mines Department, Government of Gujarat.